Read all of RedState’s CPAC notes here. Rush Limbaugh’s closing out the conference at 5 p.m. today, unless libs in Congress can pass some sort of Fairness Doctrine before then — in which case the headlining speaker will be Bill Moyers. Update: Here’s part one of Limbaugh’s speech. Follow the links at the right on YouTube or do a quick search for the remaining parts. Update II: The race for the 2012 GOP nomination is underway… here are the top four picks in a CPAC staw poll: Romney 20, Jindahl 14, Paul 13, Palin 13. I’ll have faith that the Republican Party is making headway as long as McCain’s name doesn’t sneak its way back onto that list. [Pennsylvania Sen. Arlen Specter] Ã¢â‚¬â€œ one of three who voted for the stimulus package Ã¢â‚¬â€œ found himself the target of good-natured cracks from Pennsylvania Gov. Ed Rendell and no lesser personage than the Vice President. Biden, too, expressed gratitude by telling Specter that deep down inside, the veteran Republican Ã¢â‚¬â€œ whoÃ¢â‚¬â„¢s vulnerable to a challenge from the right in 2010 Ã¢â‚¬â€œ is really a Democrat. A eulogy for Specter’s Senate career, hopefully. The only thing in Biden’s statement I disagree with is that Specter is a Democrat “deep down.” No, Joe — Arlen Specter’s Democrat streak is like your hair plugs: right there on the surface and obvious as hell. I’ve been told that the server that hosts this site will be upgraded starting at some point Monday morning, which means we’ll be offline for about 24 hours. Hopefully everything will be back to normal by late Tuesday morning. Also, we’ve been having a lot of trouble with Haloscan, or “the comments thingy” as I refer to it. I’ve posted a couple of “test” comments that just don’t show up, but I see a couple of comments have shown up. Haloscan will probably get everything back to normal just in time for our server to be unplugged Monday. Update: The comments seem to be working, but the number of comments listed above each post isn’t being updated. 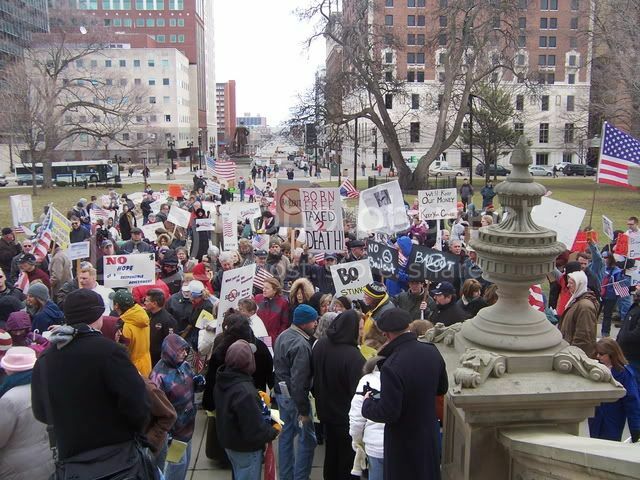 As makeshift “protests” go, the turnout at the state Capitol wasn’t too bad considering it was a Friday afternoon and the temperature in the mid-20’s. 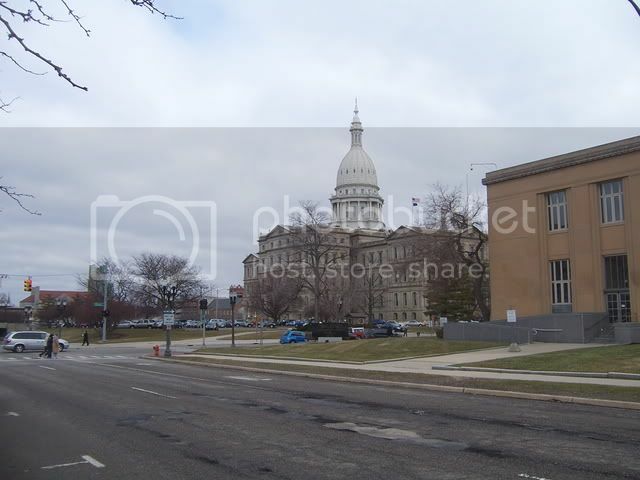 I knew the turnout wasn’t going to be fantastic though when I was able to find a parking spot just a couple of blocks from Capitol (here’s a pic taken from where I parked… the “tea party” was on the other side of the building). 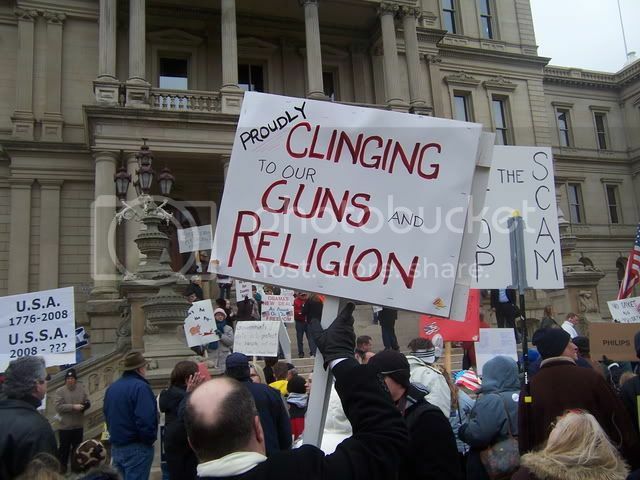 I was at a 2nd Amendment rally about ten years ago in the same place and there were at least 10,000 people there. At this event, there were between 500 and 750 people, by my best estimate. My conclusion would normally be that weÃ¢â‚¬â„¢re not pissed enough yet. 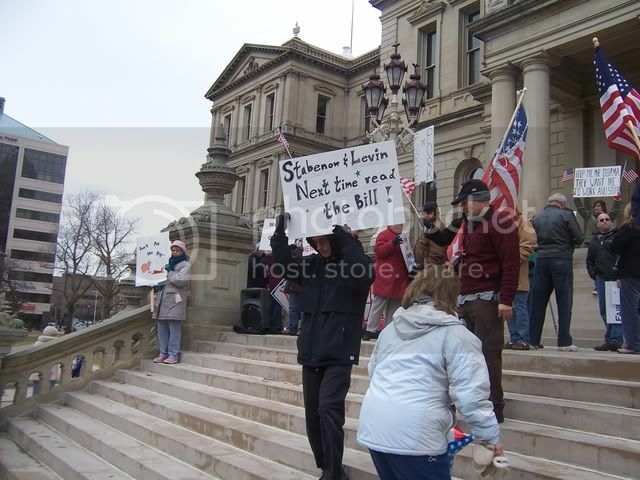 However, when you consider that this is Michigan, this was probably every Republican who lives in a 50 mile radius of the Capitol — and I’m almost not exaggerating. 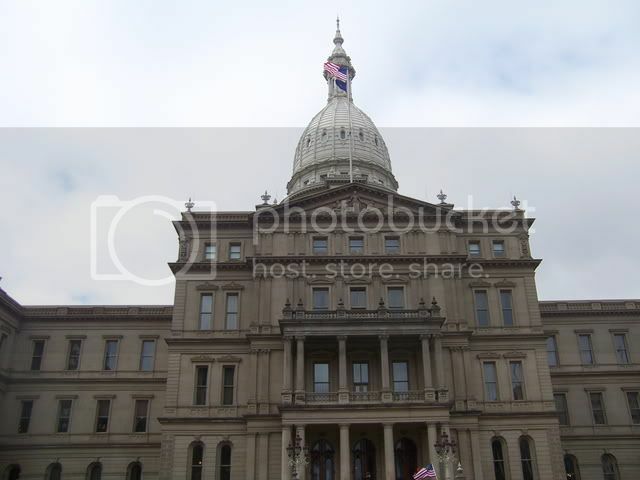 Click here for a picture of the Capitol that I uploaded just because I liked the shot. Republicans are usually notoriously bad protest organizers, and they need some serious work in this area if they’re ever to have an “impressive” turnout. First off, this kind of thing is what Saturdays are for. When you’re organizing a protest that will consist of hard working people who are angered at continued theft of their earnings, you may not want to schedule the thing while your target protester is working. That said, it was a good start — though unfortunately not enough for Congress to bat an eye at. 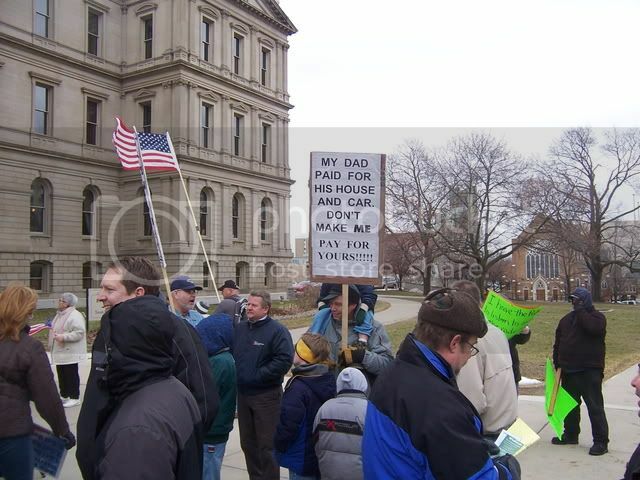 Update: Michelle Malkin has tea party pics from around the country, including one from yours truly. Banks are doing so badly these days that when you open a new account, you have to give them a toaster (rim shot) — but thankfully, the government is here to, uh, help. College of New Jersey student Michael Tracey tried to get onto the stage where Ann Coulter was signing books last week, and Tracey didn’t have a book. He was told he couldn’t go on stage without a book to be signed, but he tried to get around security anyway and approach Coulter, and that’s when moonbatilarity ensued. Naturally the student is claiming police used “blatantly excessive force.” I think the reaction was too mild, because bro didn’t use a taser this time. The story behind the video is here. “I think there was an overreaction by the security people, as far as I can tell,” said political science professor Darryl Fair, who will be speaking at the rally. Fair added he believes Tracey’s civil rights were violated. The website for “The Environmentals” is here. Why is it called “The Environmentals”? Because “The Crying Game” was already taken. I can’t look at that any more of those pictures… I’d rather be making bacon mayo. Rep. Peter King has a good op-ed in the New York Post today called “The Real Gitmo.” King visited the American detention center at Guantanamo Bay and is arguing against its closure. Detainees at Guantanamo are treated far better than most American prisoners in the US jails and prisons I’ve inspected over the years. The unfounded accusations that are so regularly and cavalierly made about Guantanamo are a slander against the brave men and women of our armed forces, who perform their duties at that facility so professionally and under such duress. * Detainees get three full meals a day with a choice of menu. * Each detainee receives a Koran and a prayer rug. * Arrows throughout the facility point toward Mecca. * Detainees receive full medical treatment – including psychiatric services. There is one medical personnel for every two detainees. * Detainees who comply with regulations are allowed out of their cells for 16 to 20 hours a day and participate in various recreational and educational activities including soccer, language training and art classes. * Detainees are allowed to confer to discuss courtroom strategy. * Guards within the facility are not armed and are regularly subjected to abuse and harassment, including having human feces and urine thrown at them. If we do close Gitmo, I propose moving these wrongly accused saints to the Democrat Cloak Room in the Capitol. This could solve a whole bunch of problems at the same time.